Maria Damion is a proud owner of a Tea room that has just recently opened. 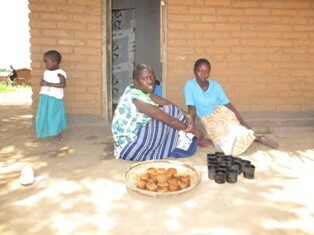 Her sister Catherine puts out the African made cup-cakes onto a bamboo tray outside the tea room to let them cool before packing them up for the customers. The tea room is getting many customers especially men when they finish working in their fields they all fill up the shop for tea. The business is very conveniently located near the elephant pump and by the road side. Maria does not have to worry about getting fresh water for her customers and cleaning up her utensils for the business. Most people in the village are attracted to her Tea Room because she is able to keep her shop clean and her utensils are also very clean. In our conversation, she stated it was not going to be easy to operate the tea room without having a reliable water source within her reach. 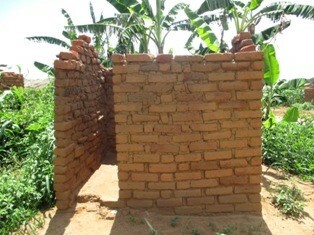 I was also curious to enquire about the rest room for the customers which was also critical for her business. Maria, admitted that she constructed a rest room that can be used by her customers in the interim although she has not yet finished putting up a roof which was blown off by the heavy storm that came through some weeks past. In the absence of the hand washing facility next to the rest room, she told us that she has a bucket that she uses with a water jug to let the customers use for washing hands. 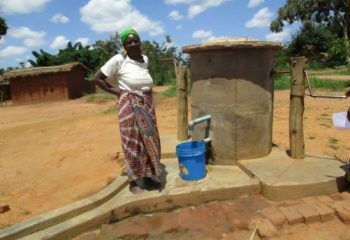 The elephant pump was installed in Matabili village late last year and the pump is benefitting 62 households. One of the beneficiaries getting water from the pump, an elderly lady, commended what a good job Pump Aid with support from BPEC did by installing a water pump in their village. She said that it was tough going for her before the elephant pump was installed. She never used to manage to go to the dambo (swamp) since it was very far. There used to be a lot of reported cases of snake bites since it was in a very remote place. The water quality was not very good since it had a milky colour. Women never used to go to be dambo in the evening since the dambo was in a secluded place. The water had a lot of parasites that caused diarrhoea and stomach pains. Now the story is different, this old lady is able to go to the water pump on her own at anytime of the day without any fear of snake bites nor getting sick because of poor water quality. In addition, the pump is so easy to operate and does not need a lot of energy to pump the water and for her it is some kind of exercise for her body. The Water Pump has a maintenance committee which is comprised of 10 members, 5 men and 5 women. The committee has been trained on how to repair the pump in case it breaks down and were able to explain where they need to go to get spare parts. The nearest trading centre for spares according to them is Mikundi trading centre. At the moment they have a saving of MK2,200 (about £2) and they are waiting to get more money from some piece works which the community did to boost the savings for the committee. Once people harvest and sell their produce there will be more money to pay to the committee. In order to earn a living a lot of people in the village rely on farming, in case of Maria and her sister, they have grown maize, groundnuts and soya as their source of food and income for their families.